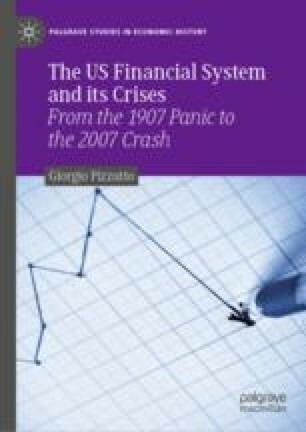 The instability manifested by the US financial system after the enactment of the National Banking Act clearly evidenced the need for a central bank that would be able to provide flexible regulation of the money supply and, most importantly, stability to financial markets. The US banking system was characterized by two weaknesses. First of all, money supply was limited and highly volatile; secondly, the cash deposited as bank reserves in the large banks of big cities (New York in particular) was withdrawn in case of need, short-circuiting the mechanism of funding the financial market. The Federal Reserve was created with the objective of stabilizing money supply and creating a short-term market, giving banks an alternative to financial call loans for their liquid assets. The attempt to create a commercial paper market failed because the regulation of commercial credit based on single-name promissory notes continued to prevail, and thus a market did not form that was able to channel the liquid assets into bank bills. Moreover using the discount rate as the only operating instrument on the commercial credit market meant making monetary policy passive with respect to the evolution of the real economy and abandoning stabilization policies that had become necessary to control prices and economic growth. It was in this period that open market operations were introduced as an additional instrument for controlling the economic cycle. Monetary policy in the post-World War II period tended to be expansionary. The reduction in the proportion of obligatory reserves, the influx of gold, and open market operations caused short- and long-term interest rates to drop significantly until 1927.